Vegan baking isn't something I thought I'd be into. Butter and eggs are hallmarks of almost every type of baked treat such as cookies and cakes. Forgoing those ingredients might mean making substitutions that just don't quite give you the same richness or texture. That's why this recipe by ShopCookMake appealed to me. Rather than substitute for those ingredients, it just omits them. And the results weren't just adequate, they were fantastic. This is a delicious lemon cake perfect for springtime. Instead of butter, the cake is made with vegetable oil, which is a common substitution anyway, even if the cake recipe also uses eggs. Yes, the cake wasn't quite as rich as a cake with butter and eggs, but frankly the lack of richness contributed to this being a "lighter" treat in keeping with the season. I made a few alterations to the recipe. First of all, I increased its volume to be appropriate for a 9 X 13 baking dish. Although the original author declined to specify the size of the baking dish for her recipe, its volume of 1 1/2 cups of flour suggests to me that it was ideal for a 9 X 9 pan (although her cake is clearly rectangular--she must have a different size pan I'm not used to). Additionally, I used only lemons, instead of lemons and limes, and I omitted the vinegar, which struck me as superfluous. The reason a cake recipe would have vinegar is to contribute acid to activate the baking soda and thus create leavening. 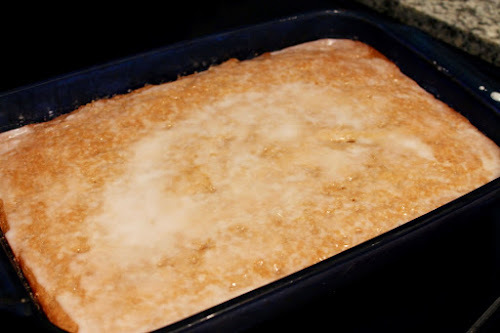 This cake already has a generous amount of acid from the lemon juice and, given that lemon cakes are comparably more delicate in flavor as compared to, say, a chocolate cake, I was concerned the vinegar could add unwanted flavor. Omitting it just makes the recipe simpler. 2. Zest the lemons, then juice them. You'll want 1/3 cup of juice and about 3 tbsp. of zest. 3. Whisk together the flour, sugar and baking soda in a large bowl, then stir in the lemon zest. Whisk together the lemon juice, water, vanilla and oil, then add to the dry ingredients and whisk together until combined. 4. Brush a 9 X 13 baking dish with vegetable oil, then pour the batter into the dish. Smooth the top with a spatula. Bake until a toothpick or knife inserted in the center of the cake comes out clean, about 25 to 30 minutes. Remove the cake from the oven and set on a cooling rack. Cool completely before icing the cake. 5. Combine the remaining lemon juice and powdered sugar in a small bowl, using a spoon to mix the icing until smooth. Pour over the top of the cake. Serve the cake from the pan, cut into squares. Hi Andrew, how about using apple sauce instead of oil? mc from work. Hi MC! I've not tried using applesauce in baked goods, although I know a lot of people like to do so. I did some searching, and most of the recipes I saw for cakes still included some fat--usually butter. So I don't know if you can go all applesauce. It might make for a dry cake. If you try it, let me know.